First off, happy Veteran's Day and THANK YOU to all those who serve or have served our country! It's important to remember that this freedom came with a price. 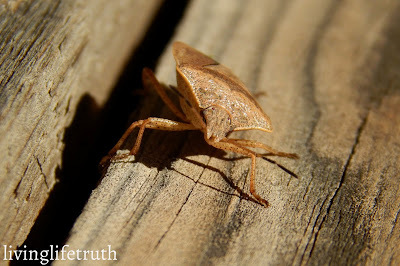 E found this little bugger and had him crawling all over his coat. We did our research (or wikipedia'd it) and found that it was a brown marmorated stink bug. Later we wrote on the sidewalk in "cattail fuzz" after a cattail sword fight with his brother (of course). There is so much life to explore outside this Fall. The kids and I are trying to take it all in before everything freezes solid. Coming up next week we are going to hunt for Maple leaves and seeds for the Outdoor Hour Challenge! 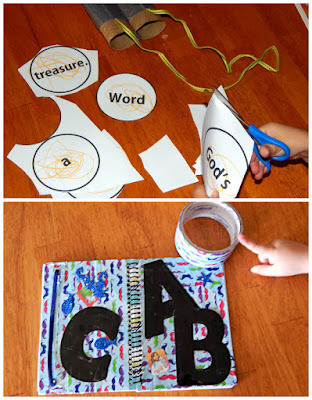 As for indoor time, we worked through a couple more activities from God's Little Explorer's Week 1, which focused on treasure hunting and the letter "X". E cut out treasure hunt pieces, we hid them around the house and he used his homemade binoculars on the hunt. As for my "Mother Culture", I read in bits hear and there throughout the day. If you are new to Mother Culture, check out Karen Andreola's post here. Along with the Bible, I am working my way through a couple other books. Slowly but surely! Embracing the Race devotional by Lisa Preuette - Review coming next week! What adventures have you been on lately? Do you have Maple trees in your area? 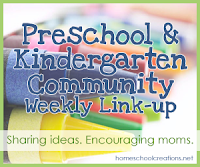 We are using the free version of God's Little Explorers Preschool Curriculum from Motherhood on a Dime for activity ideas with our 3.5-year-old and the 1.5-year-old spends his time finding trouble or hanging on Mommy's legs. Joining up with Preschool & Kindergarten Community Weekly Link-Up, Homeschool Blog and Tell, and Mommy Moments.